Despite a raft of ceasefire agreements, on-and-off hostilities between Burmese government troops and ethnic rebels on the ground are threatening to undermine the delicate peace negotiation process. Since late 2011, Naypyidaw has signed ceasefire pacts with several major armed ethnic rebels groups including Karen, Shan, Mon, Chin and Karenni militias. But clashes which have broken out on the ground contradict these pledges made around the negotiating table, causing observers to become confused as to the true state of affairs. Nowadays, the talk of the town among ethnic Karen war refugees living in temporary shelters on the Thai-Burmese border is the increase in military supplies reaching government bases. They told The Irrawaddy that government forces have increased their military supplies ever since the Karen National Union (KNU) signed a ceasefire agreement on Jan. 12 in Pa-an, the capital of Karen State. Military supplies are openly being sent to KNU areas without the threat of attack due to the terms of the ceasefire pact. Local KNU armed units said they have also witnessed the transportation of government military supplies by boat on the Salween River since January, but they did not disturb the shipments. War victims who have been displaced for years in the jungle or temporary shelters in Karen State also not dare return home as government troops have been increasing their military presence in KNU-controlled areas. A couple of Karen internally displaced persons at a temporary shelter on the Thai-Burmese border said that local villagers are very worried about the ceasefire breaking down due to the apparent stockpiling of weaponry. They said that local people and Karen military units will be the ones who suffer attacks and human rights abuses firsthand if outright hostilities resume. According to the Bangkok-based Thailand Burma Border Consortium (TBBC), a humanitarian organization that provides assistance to war refugees on the Thai-Burmese border, there are more than 450,000 civilians currently internally displaced in a rural area of 50 townships in eastern and southeastern Burma alone. Household poverty assessments across 14 townships indicate that 63 percent of homes are unable to meet basic needs. Htoo Klei, the secretary of the Karen Office of Relief and Development, a humanitarian group which operates in the conflict zone in Karen State, said that skirmishes between the Karen National Liberation Army (KNLA)—the KNU's military wing—and the government broke out in early March. Baw Boe, a KNLA soldier at the frontline, claims that Burmese troop positions have built up a three-month supply of armaments and food. He doubts the government’s sincerity as their soldiers seem to be preparing for battle while their leaders talk about peace with the KNU. “If [the Burmese government] really wants to make peace, they have to reduce their troops in our areas. Instead, they increase the military supplies,” said Baw Boe. Another ethnic rebel group, the Shan State Army-South (SSA-South), which agreed a ceasefire in December, has claimed that government forces still attack its frontline positions despite the truce. 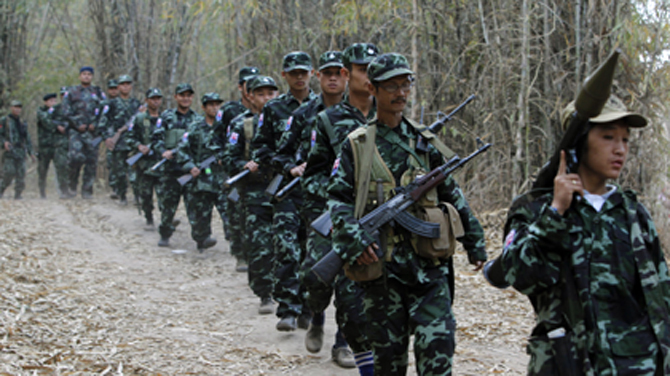 Government troop reinforcements have also increased in Shan State since SSA-South leaders signed the agreement. On Mar. 11, government troops launched offensives against rebel outposts in Mong Yawng Township, east Shan State, and in Kyaukme Township, northwest Shan State. Heavy fighting was also reported between the Kachin Independence Army (KIA) and government troops in northern Shan State on March 12. This came just two days after leaders of the KIA’s political wing, the Kachin Independence Organization (KIO), held unsuccessful talks with a Naypyidaw peace delegation in the Chinese border town of Ruili. More than 20 major and minor ethnic minority rebel groups, including the KIO, have signed ceasefire agreement since 1989. The KIO signed a ceasefire agreement in 1994, but it broke down in June 2011 when government troops launched attacks against KIA bases causing at least 40,000 Kachin civilians to become refugees. Saw Eh Doh Wah, a Karen community leader who participated at a recent unity seminar in KNU-controlled areas, said, “Look at the example of the KIO.